This week, we have a problem with free speech. It seems, a few of our citizens do not understand that the right to free speech…is only reserved for a few: Like Joe Biden, John Kerry, and Jane Fonda. John Jamason incited the wrath of Council on American-Islamic Relations Florida, Inc because of a Facebook post about Islam. On Friday, September 13, the group demanded that all social media posts made by Jamason be turned over to them for inspection. They asked for a public records request to the county commission asking for communication sent by Jamason from any country computer within the past 3o days. This includes social media comments or anything that would be deemed personal. CAIR Florida has their hands in each of these incidents, threatening. That’s what they do best. CAIR is Hamas. They are virtually one and the same. CAIR’s strong ties to the Muslim Brotherhood are also well documented. This is a terrorist organization. So, what did John Jamason say on his personal FACEBOOK page, on his own time? Unless I’m mistaken, what John Jamason does on his own time, and what his opinions are, have nothing to do with his job at the government. If he was to harass Muslims for no reason, while at work, then they might have a case…but he has not committed the crime. His mistake was thinking he was still living in the land of the free….not in some minority report Steven Spielberg nightmare. “Within an hour or two,” as McCall told the Daily Dot, Zazzle emailed him to say the shirt had been removed from the Zazzle site. Unfortunately, it appears that your product, ” the nsa”, does not meet Zazzle Acceptable Content Guidelines. Specifically, your product contained content which infringes upon the intellectual property rights of National Security Agency. Whoa: Yes the NSA put their Apples down, and crammed a “YOU ARE NOT ALLOWED” notice on some guy just trying to make a few bucks. You would THINK they’d have better things to do, like uh..protecting our military bases? So NOW the government is claiming intellectual property rights on its logos. What’s next? Will Presidents get royalists off the Presidential Seal? If I put the American Flag on my window, will the NSA come to collect an intellectual property rights royalty fee? 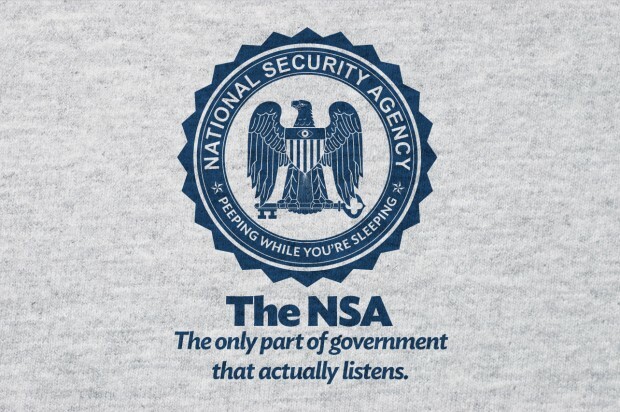 The NSA does NOT own it’s seal. It belongs to the American people. So I suggest we all find this tee-shirt and buy one, just to upset those retards. So, who wins the Nobody’s Perfect Award of the week? Well, legally speaking, both parties had constitutional rights granted by the 1st amendment, so even though both were considered to be lawless sum-bags by the Obama administration…it’s obvious who the winner is, isn’t it? 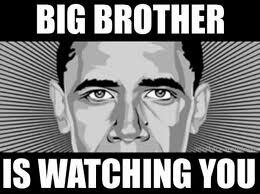 The Obama Mao Government which is supporting free speech suppression by putting its big foot on the little guys. Obama wins the Nobody’s Perfect award for the week, and most likely, the century. He has three….more…years.